One of my highest priorities in Harrisburg is ensuring taxpayer dollars are not lost to waste, fraud and abuse. It is especially important to maintain the integrity of programs that help some of our most vulnerable state residents – including the Supplemental Nutrition Assistance Program (SNAP), which helps keep food on the table for many low-income families. Unfortunately, SNAP is a major target for abuse. The Office of State Inspector General uncovered a scheme last year involving a Harrisburg restaurant trading drugs for EBT cards and buying thousands of dollars of supplies from a food wholesale club to be resold for profit. The plot involved the fraudulent use of nearly 60 different SNAP recipients’ benefits. When SNAP is targeted for fraud, it not only hurts taxpayers, but also the families that rely on that critical source of support. During the current legislative session, I partnered with my Democrat colleague, Senator Judy Schwank, to introduce a bipartisan bill to help prevent individuals and businesses from unlawfully trading goods or services for SNAP benefits. I am extremely proud to announce that our bill was signed into law this week. The new law ensures any individual who is convicted of SNAP trafficking could be found guilty of a second-degree felony and be required to pay restitution of up to three times the amount of the fraud they committed. The law should play an important role in holding offenders accountable for the damages they cause. More information about the new law is available here. With the school year in full swing and cooler temperatures forcing more local families indoors, conditions are ripe for the beginning of flu season. The U.S. Centers for Disease Control and Prevention (CDC) offers a number of tips to help prevent the spread of the flu here. The return of colder weather to the region means many local individuals and families will soon face higher energy and heating bills. Pennsylvanians who have a heating emergency or are struggling to pay utility bills can receive assistance through the state’s Low Income Home Energy Assistance Program (LIHEAP). LIHEAP provides grants to help low-income families pay heating bills. Crisis grants are also available for heating emergencies such as a broken furnace, utility termination or fuel shortage. Eligibility and grant amounts are based on income and the number of people living in a household. Applications for LIHEAP can be completed online on the Commonwealth of Pennsylvania Access to Social Services (COMPASS) website at www.compass.state.pa.us. Additional information about the program is available online at www.dhs.pa.gov. 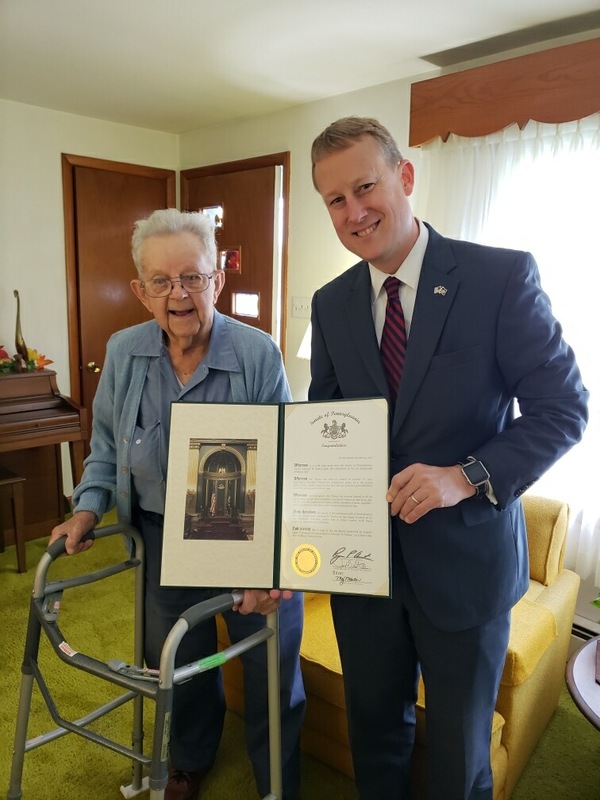 I had the pleasure of presenting certificates to Edward Wance from New Holland and Mary Stauffer from Fairmount Homes in Ephrata this week in honor of milestone birthdays. 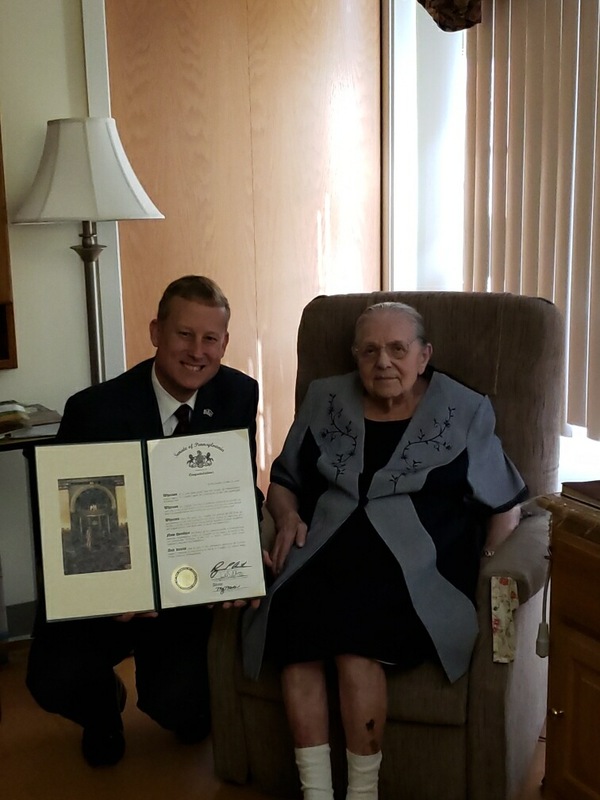 Both of these local residents turned 100 years young. Happy birthday! Prescription drug costs are one of the most important concerns for many seniors. A new state law I supported will expand prescription drug coverage to an additional 14,500 older Pennsylvanians. The bill expands the income eligibility limits of the PACENET program from $23,500 to $27,500 for single individuals and from $31,500 to $35,500 for married couples. More information on prescription drug assistance programs is available here. The second annual “Talk To Your State Senator” statewide video competition invites students to submit a video entry of no longer than three minutes to highlight ways to improve school safety. I encourage local students to participate in the discussion and speak out for safe schools. The contest, which is sponsored by the Senate of Pennsylvania and the Pennsylvania School Boards Association, is open to Pennsylvania students in grades 6 through 12. This includes students who attend public or private schools, as well as students who participate in homeschool programs. Contest details are available online at www.legis.state.pa.us/talk-to-your-state-senator/. Each October, the streets of Lancaster County are invaded by hundreds of tiny ghosts, witches and superheroes searching for special treats. It is critical for parents, chaperones and older children to observe certain guidelines to ensure our local trick-or-treaters return home safely. Halloween safety tips are available here. I also encourage all local motorists to drive safely and slowly during trick-or-treat events, especially in residential neighborhoods.